Did I say that I was sad this was the last prom dress? Let's just say I have developed a great deal of admiration for professional seamstresses who must deal with fussy clients in order to make a living. And I'm glad to say I am finished. In my opinion, the dress came out lovely. The "client" did tell me that it was her favorite dress when all was said and done. 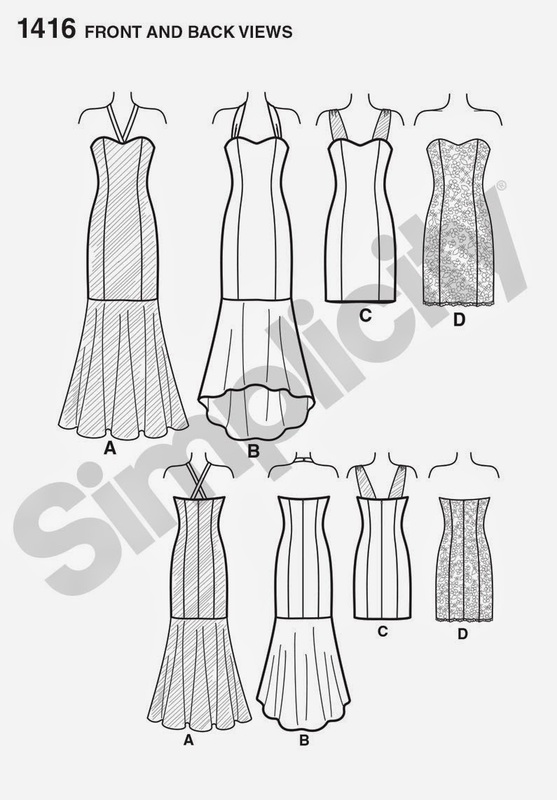 We used Simplicity 1416, since it was closest to the inspiration piece, combining the halter straps of view B with the skirt/flounce of view A. I made only slight modifications to it, keeping the princess seams rather than going with the bias-cut design of the Narcisso Rodriguez dress. Although I think it is in my wheelhouse to draft it, we just didn't have the time, or the right fabric locally available. I highly recommend this pattern. It required minimal fitting work (FBA and swayback adjustment were all I did) and had pretty good instructions (though I changed the order of the construction and veered from them frequently due to some changes I imposed). I can see myself using this to make a short sundress, as it's very flattering and easy to put together. 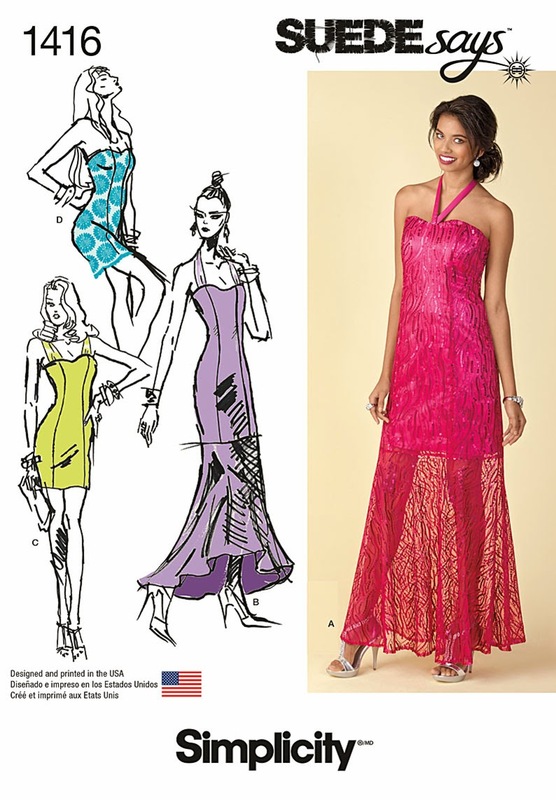 - I flattened the sweetheart neckline to mimic the inspiration dress. This may be have only been necessary due to the FBA, which increased the "roundness" from the original pattern. We wanted to keep a slight sweetheart neckline, though. - Used Susan Khalje's method (from her Bridal Couture book) of easing the seam allowance of the front neckline to tighten the fit against the upper bust. I had never tried this, but it worked great. Close-up of neckline. Dad was the photographer this year, while I made dinner. - Although the pattern does include instructions for boning the lining at 6 seams, I went further with a 15-stay corselette, and a waist stay. Wanted it to move with her, and I think it gave her a close, but comfortable fit. View of corselette and waist stay. - Lengthened the flounce by 2 inches to accommodate long legs -- more volume there versus lengthening the dress above the knee, so she would have more room to walk. - Tapered the dress between the hip line to the lower seam in order to get more of a "mermaid" look (took about 2 inches out of the circumference, mostly from the side seams and front seams, leaving the back alone). Don't let crappy lining ruin your project! We bought all the fabric at a chain store. Of course they didn't carry silk, but they didn't even carry Bemberg lining. The awful polyester lining reminded me of nylon windbreaker fabric from the 1970s. I expected it to fray, which it did. It was also very difficult to sew, snagging and bunching up even though I used very fine thread and a microtex needle. I'm just glad it doesn't show anywhere. It was named "hang free" lining, but it clung mercilessly to everything. Surprisingly, the polyester crepe-back satin that we used for the fashion fabric was very nice to sew with and I'm pleased with the final results. As soon as I cut it and stay-stitched it, I overlocked the edges, because I was afraid it would fall apart before I could sew the pieces together. I ended up trimming the serged edges with a pinking blade before lining it. Once the project was complete, I caught myself thinking that I may actually sew with this fabric again. I think this was my daughter's favorite dance, even though she was exhausted. Her day started around 4 AM, since her chamber orchestra was kicking off an early morning business meeting (her reward was getting to hear Madeline Albright speak). And of course the day didn't end until Sunday morning. We hosted dinner for six at our house -- three girls and three boys, all friends, all great kids. I'm sure it was a night she will never forget. An outtake of the fun group. My atelier was contained in several bankers boxes and packed away, so that the dining room was relatively neat for a big dinner. I've promised no big projects until I finish the outdoor curtains I started last summer. Only one is complete. Seven more to go. The plan is to finish before the graduation party. As for the "last dress" sadness, I suspect there will be more. My daughter auditioned and was accepted to the university's orchestra for next year, so she will need a formal black dress. Can't borrow mine anymore, and she needs a younger look, anyway. She has grand ideas for something spectacular, of that I am sure. My sister’s wedding will be held in this July and we couldn’t buy her wedding clothes due to some reasons But now She told me to buy low price wedding dress as she will wear this dress once a life. So, do you think used wedding dresses are the best choice for us?